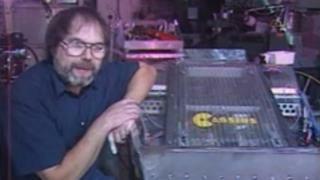 The inventor behind the car in children’s television programme Brum and a Robot Wars “legend” has died. Suffolk “bodgineer” Rex Garrod had been living with Alzheimer’s for eight years and died aged 75. Mr Garrod, who also competed in speedway, made objects for television shows including Teletubbies as well as building the eponymous adventurous remote-control car Brum. His wife Sally Garrod described him as a “big kid at heart”. The couple lived in Stowmarket and his wife said whenever her husband ran out of room he would build some more. Growing up in Mickfield, Suffolk, Mr Garrod rode for Ipswich Witches, as well as Scunthorpe, in speedway before venturing into special effects alongside former motocross rider Dave Bickers. He presented Channel 4’s The Secret Life of Machines with fellow inventor Tim Hunkin, who paid tribute to him on his website. He described Mr Garrod as a “true genius”. As well as his own TV work Mr Garrod entered three robots into BBC’s Robot Wars, which saw teams build and fight machines. His second entry, Cassius, is credited as being the first self-righting robot, one which was able flip itself back the correct way if it rolled over. Fans and robot designers have paid tribute to Mr Garrod since his death on Monday. Robotics professor and Robot Wars judge Noel Sharkey said: “Rex Garrod was a great innovator who helped up the game at Robot Wars with his mechanical marvel Cassius with the first successful self-righting mechanism, or srimech as it became known. Teletubbies creator Anne Wood, creative director of Ragdoll Productions Ltd, said: “We loved working with Rex both on Brum and in creating interactive Teletubby devices. He leaves behind two daughters, Kim and Kay.